"When I was nine years old, a barnstormer in a Jenny... sold rides... being the last to go up, my brother Mike and I got a ride for the price of one, $5. That ride proved to completely change our lives." 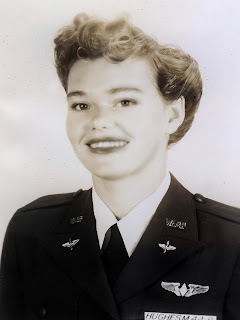 On January 17, 2011, WASP Marguerite "Ty" Hughes Killen quietly took her final flight, surrounded by her loving family. She was born May 16, 1924 in Superior, Arizona, about an hour east of Phoenix, but grew up in Wellton, near the border, in southwest Arizona. It was in this small town that young Ty fell in love with flying at age 9. While Ty was in high school, a CPT program (Civilian Pilot Training) began at Fly Field nearby. A family friend was hired as a flight and ground school instructor and, once he told the young girl that there were jobs available, Ty immediately went to work. "I started working after school and weekends, gassing planes, sweeping hangers, pushing planes in and out of the hangers, checking gas levels, servicing planes and cleaning rest rooms. My pay was dual flight instruction wherever the instructor could sandwich me into his busy schedule. At night, I attended ground school with the CPT trainees. My world was at Fly-in Field after school until dark, and weekends from sunup until dusk." Ty went on to pass her flight tests and became one of the first women to get a commercial and flight instructor rating--on her 18th birthday. Ty enrolled at the University of Arizona in Tucson in September of 1942. She paid for her education by instructing at Gilpen Airlines, after school and weekends. While continuing her studies, she heard a radio announcement about the women pilot's training program beginning in Texas. Although she met all the requirements, she was only 18, and the minimum age limit at the time was 21. In August of 1943, the age limit for the WASP training program was lowered to 18 1/2. She immediately called Jacqueline Cochran's office and set up an interview. After passing all the requirements and the Army physical, Ty was accepted into the class of 44-8. November 1, 1943, Ty married her childhood sweetheart, B-24 pilot Lt. Fred Hughes, who was soon sent overseas. In March of 1944, Ty left her home in Arizona and paid her way to Texas. On March 13, she and 107 other young women pilots, raised their right hands, took the military oath and entered Army Air Force flight training. In July, while she was still in flight training in Texas, Ty's husband was killed half a world away, flying over the Himalayas. Determined to serve her country, she stayed in training, using her talent for drawing to lift the spirits of her classmates. After 7 months, she passed her final check rides and exams, and graduated on October 16, 1944, along with 48 classmates. After graduation, Ty was sent to Childress Bombardier School in Childress, Texas, where she flew the AT-11, AT-6 and BT-13, training male students to become bombardiers for combat. On December 20, 1944, when the WASP were officially deactivated, Ty paid her way back to Tucson, returning to work as an instructor and enrolling in the University of Arizona. In 1948, she graduated from college and remarried. Soon, the young couple started their family, eventually having 1 son: Jim, and 3 daughters: Talley, Kelly and Shauna. In 1990, Ty wrote about her life in "Out of the Blue and Into History" by WASP Betty Turner. In her own words, she described herself as "a happy grandmother of 8," continuing, "I treasure my love and involvement with family, flying, painting, gardening, teaching, and enjoying the continual blessings of an active full life. But the WASP are still there! We live in the greatest country in the world. And we helped to realize this...together." 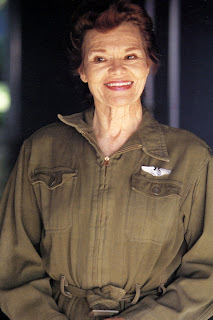 On March 10, 2010, when the WASP were awarded the Congressional Gold Medal, Ty was in the audience, dressed in her WASP uniform, sitting on the back row. She was smiling... and, as she always did, she was glowing from the inside out. I was honored to meet Ty in 1994 at the WASP Convention. My dad passed away 6 months earlier and I had convinced mom that it was important for her to attend. It was a tough and challenging time. Mom and Ty had never met, yet immediately, there was a beautiful connection. Never had I met anyone so instantly giving and kind. If a life can be measured by the caring, love and passion for living shared with others, then Ty Killen's life is rich indeed. Her daughter, Kelly called her an angel. Indeed she was...and is. God bless her family and all those whose lives she touched and who will always remember her--for her kindness and her loving spirit. OFFICIAL INFORMATION WILL BE ADDED TO THIS POST WHEN IT IS AVAILABLE. Ty was a wonderful, energetic and giving person with a great sense of humor. I met and worked with her in her job as school teacher at probation camps in LA County. She will be missed. God speed, Ty!! Ty was a regular customer at the bookstore that I worked at in Lancaster, Ca. She was a wonderfull, energetic woman who loved to talk to the schools. Just recently, Lancaster High School commisioned a mural (done by Victory Girl) of the WASPs that features Ty. It can be seen on victorygirl.com.